The Praxis is the easiest battleship to jump in, as it only requires Spaceship Command I, which even Alpha Clones have available by default. 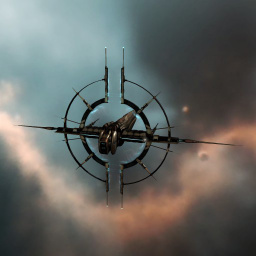 The Praxis is a Jove battleship, with one given to every player for EVE Online's fifteenth birthday. It has a balanced slot layout and resist profile, allowing it to fit a strong armor or shield tank, at the expense of being the one of the slowest and bulkiest battleships in the game. Like all other battleships, the Praxis benefits massively from a full T2 tank, T2 drones and T2 guns, despite its seemingly low skill requirements mentioned above. Since the Praxis lacks any kind of skill bonuses, the method of flying this battleship can vary greatly from pilot to pilot. This also means that your enemy cannot guess and attempt to counter the fitting without actually getting into combat first. Following the release of Praxis, other three SoCT ships - The Gnosis, the Sunesis, and the Apotheosis - received a minor design change where the hulls now display the blue energy aura and beam effect the Praxis possesses. This page was last modified on 24 January 2019, at 01:49.